I wrote this story years ago, long before lanterns became valuable antiques. The story, or condensed versions, has been picked up and ran by several publications over the years. A little backstory on Molly the mule. A “Molly” is a name sometimes used for a female mule. My older brother was in his mid-teens at the time of this story. He was a cowboy. He had ridden every horse on the place. But the mule was his nemesis. The hands mentioned in the story would talk him into trying to ride her and then place bets. The odds were long but he was game. They took her into a newly-plowed field close by, so he would have a softer landing. Molly threw him off several times and then she let him ride clear to the other end of the field. Once there, she unceremoniously dumped him and made him walk back. End of game, she was tired of playing. A story of days gone by. It was rusted in a place or two, covered with grease and dust. The globe was still intact. The auctioneer set it in for a dollar and started begging for a dollar fifty, wanting someone to get him off the hook. He turned it in his hands and I saw the word Dietz embossed across the top. Dietz kerosene lanterns, they must have made a million of them. They were a common item in rural America a generation ago. Dietz and John Deere, I could spell the words long before first grade. I nodded my head and I swear he breathed a sigh of relief. I took it home and hung it on the stairwell. The kitchen is warm, the smell of sausage, biscuits and gravy, and fresh coffee permeate the predawn air. The hands and family all set at the long table and the platters empty quickly. We pick our corn by hand. One to three corn huskers work at it most of the winter. They are paid a few cents per bushel and board. I think the board is the most important part of their wages. Breakfast finished, we put on the heavy clothes and step out on the porch to light the lanterns. The frozen ground crunches underfoot as they move to the barn. The horses are waiting to be grained and Dad moves through the feed way dropping corn in the feed boxes as the hands put the harness on by lantern light. He is right, she will bite, unless she sees that you have a club handy. I guess we keep her because she is good to break young horses to harness with. It is getting light and there is a flurry of activity. The harness creaks and chains jangle as they bring the teams to the wagons. Ned, Jim, Buck, and Shorty, and the others. They dutifully step across the wagon tongue and back in to be hitched. All but Shorty, every morning she balks at stepping over the tongue. Every morning the hands pop her on the rump with the end of the line and she steps over. She seems to think that is a required procedure. The wagons rattle as they jolt over frozen ruts on the way to the field. Soon the sound of ears hitting the wagon backboards can be heard. The hands shout the horse’s names and few choice words in the clear morning air. Mom doesn’t allow cuss words around the house, but they are given freely in the field! By this time he is milking and the lantern’s warm glow is lost in the cold morning light. I’m getting cold and start to whimper. He ignores my pleas to go to the house, until he finishes milking. He rises from the milk stool and takes the lantern down. He raises the globe and blows out the flame. Dusk to dawn security lights, weatherproof lamps, three way switched circuits, and remote controls are a part of my life now. I have no use for an old kerosene lantern, but I’ll leave it hang in the stairwell. When I go by I’ll work the lever and listen to the screak of the globe going up, and remember how it was in the times gone by. The left foreground wagon is a two horse hitch. Oops! That is Molly the mule, and a horse to her left. I have ridden the wagon seat on the front wagon with Granddad Ryan. He would always buy me an ice cream cone after the wagons were unloaded at the grain elevator. The rationing of gasoline during WW II did not bother my Grandfather Ryan. Even though we had tractors and access to trucks, he hauled his stored grain to market with horse power. The two back wagons are hooked together in tandem. Both the tandem hitch and the right front wagon seem to be three horse hitch. Here I am (on the left) with my Uncle Art back in the days of rusty lanterns. Art Cole was a funny guy. Everything he said or did was spiced with humor. He was a good guy and my favorite Uncle. He worked in the California Citrus Industry. When he had time off he enjoyed visiting us on the farm. 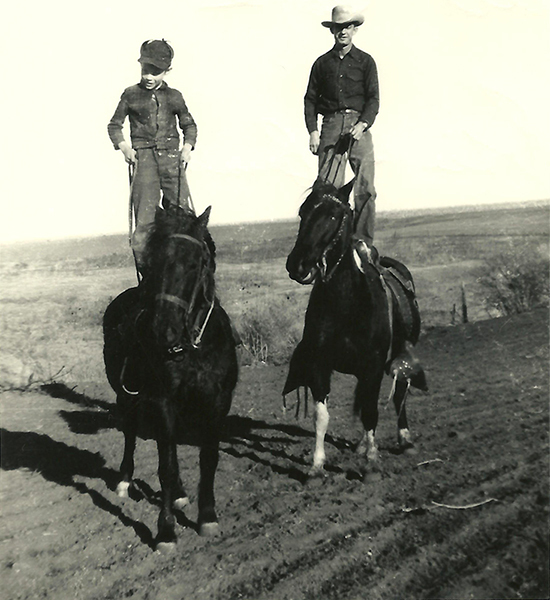 As Mom prepared to snap the picture, he said, “Quick, stand up on the saddle.” We did, and instead of the “run-of-the-mill” cowboy picture it was forever different and a lasting memory along the Sundown Trail.